Chitwan Jungle Safari is the exploration trip of wildlife in Chitwan National Park. Chitwan National Park is the first national park of Nepal established in 1973 and grabbed the status of UNESCO World Heritage Site in 1984. Chitwan National Park is located Terai region (flat part of Nepal) 186 km southern from Kathmandu. Its forest and grasslands extended over more than 2600 km squares and were residence to about 800 rhinos. It is also the home of the more than 700 species of wildlife and more than 600 of butterfly, moth and insect species. 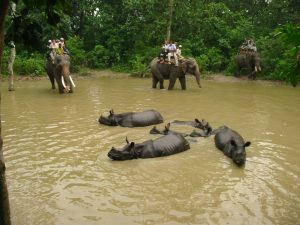 In Chitwan Jungle Safari you participate in different National Park activities. The majors are Elephant Back Safari is to encounter one-horned rhino and other wildlife; Canoe ride in the Rapti River is for watching of crocodiles and birds; and Visit of Elephant Breeding Centre is to see baby elephants. The other activities are jungle walk, bird watching, bathing and swimming with Elephants in the Rapti River, village tour and to participate in a cultural program of Tharus, the indigenous group is living nearby National park. Excellent Himalaya Trek & Expedition offer best price for Chitwan Jungle Safari tour. For the price you are requested to send us an inquiry mentioning no. of people who are interested to doing this activity. We will hear back to you within 24 hours. Day 1: Drive Kathmandu to Chitwan National Park. Morning drive to Chitwan National Park (186 km / 5.5 Hours) from Kathmandu. Transfer to Jungle Lodge. Welcome drinks and briefing about your all jungle activities by National Park guide. Then Lunch at the lodge. Afterward National Park guide will take you for Jungle Walk (1 hour). In the evening participate in Cultural Show by Tharus, local indigenous group. Then have a dinner and rest at Jungle lodge. Overnight at Jungle Lodge. Day 2: Jungle activities inside Chitwan National Park. Wake up call in the morning. Have a breakfast. After that you will be taken for Elephant Back Safari. This activity an excellent opportunity to encounter rhinoceros, deer, rhesus monkey, wild boar, wild cats, leopards, even royal Bengal tiger if you are lucky and other mammals. Subsequently you will go for Canoe ride along the Rapti River. While canoeing you can view various species of birds on the bank of river and crocodiles. In the afternoon you can also enjoy the elephant bathing. Then lunch at lodge. Next you will move for village tour of Tharus, the indigeneous group living nearby National park. Overnight at Jungle Lodge. Day 3: Drive back to Kathmandu. Breakfast in Jungle lodge. Then drive back to Kathmandu.